Located in Tla-o-qui-aht First Nation Ha-houlthee (chiefly territory), the Kennedy River flows into Kennedy Lake—the largest lake on Vancouver Island. Once, Kennedy Lake was the leading sockeye producer on the Island’s west coast with returns from 300,000 to one million. The stock collapse just prior to WWII, recovered and then collapsed in the early 60s, and has not recovered since that time despite over 50 years of no fishing. Through the Pacific Salmon Foundation’s Community Salmon Program, the Nuu-chah-nulth Tribal Council has been working with Tla-o-qui-aht First Nation on a project to determine how to rebuild sockeye stocks. 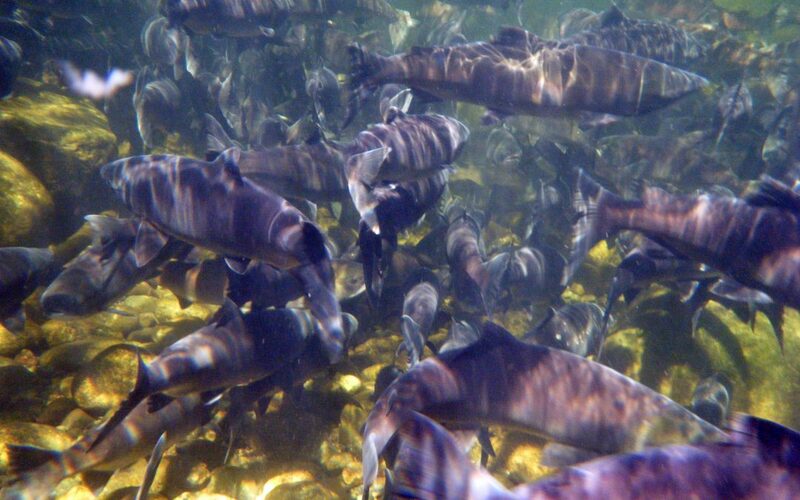 Determining how to rebuild Kennedy sockeye, starts with finding a cost effective way to count adult sockeye, so Tla-o-qui-aht can see what rebuilding activities result in more adult sockeye returning to Kennedy Lake. Because the water in Kennedy Lake system is the colour of tea, counting fish visually is not very effective, so other methods are required. One method is using sonar. “Last year was a trial year to assess whether the ARIS SONAR was the right fit for the Kennedy and whether we had the location and other specifics correct around the way the unit was set up,” said Candace Picco, Uu-a-thluk Central Region Biologist. ARIS SONAR is a device that sends out soundwaves and receives the waves coming back as images that are then analyzed and, in this case, used to count fish. Although the count last fall was difficult to determine due to the fact that fish were able to swim around the sonar beam, counts were inaccurate. “We were unable to determine the number of Kennedy sockeye returning to the Kennedy system,” Picco said, adding that in the spring the team will add fencing to the area to force the fish to swim through the sonar beam and should result in a more accurate count. “We learned several lessons last year and we’re ready to try again this year, she said. Uu-a-thluk and Tla-o-qui-aht First Nation are working with DFO to set up the ARIS again this spring and will continue to refine the project.